FILE - Taban Deng Gai, shown Jan. 8, 2014, has been nominated to become South Sudan's Acting First Vice President to replace Riek Machar. Members of the SPLM In Opposition nominated Taban Deng Gai over the weekend to become South Sudan's Acting First Vice President to replace Riek Machar, who went into hiding shortly after fighting broke out in the capital, Juba, in early July. Machar's spokesman Peter Gadet condemned the nomination of Gai, and issued a statement calling on IGAD-plus (Intergovernmental Authority on Development) countries, the Joint Monitoring and Evaluation Commission and other international bodies to reject Gai's nomination. Jok Madut Jok, a South Sudanese political analyst with the Juba-based Sudd Institute, said Gai's nomination presents a challenge to the Kiir administration, noting that some troops loyal to Machar adamantly oppose a move to replace their leader. But Jok also said he's not surprised there is a move afoot to replace Machar, President Salva Kiir's longtime adversary, since Machar cannot be found. However, Jok added, “I wouldn't be surprised if the president does not issue a decree right way because there are other competing challenges, one of which is that Gai is seen as someone who does not command a lot of control or support over the forces." FILE - South Sudan's rebel leader Riek Machar addresses a news conference in Ethiopia's capital, Addis Ababa, Oct. 18, 2015. Jok also pointed out that Gai is seen as one of the people who has been in competition with other political families when he was appointed governor of Unity state. 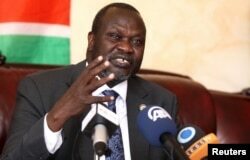 Machar did not respond to a 48-hour ultimatum issued by the president to return to the capital. The five members who were present during Saturday's vote to replace Machar bypassed the rules of their party, choosing instead to follow the regulations outlined in the August peace agreement "that gives lawmakers the right to fill positions if they become vacant, for whatever reason," Jok said. Jok added that if and when Machar returns to Juba, the belief is that Gai would immediately quit his post as Acting First Vice President and give it back to Machar. "That is what they are counting on. That is, it is not a coup. That is, he [President Kiir] is simply filling a vacuum," Jok said. Because Machar is not in Juba, the only way his supporters can challenge the decision to replace him as First Vice President is to go to war, according to Jok, because they have no legal basis to challenge the move in a court of law. Jok describes Gai as a former liberation fighter, "one who is very able, a very likable field commander since he was a young person at the beginning of the SPLA in the 1980s."